Chef Robert Linton of Bar Mezzana prepared pasta tagliolini with crab, Meyer lemon, and chili for delivery by Caviar, which works only with higher-end restaurants. As more restaurants open across the city, they’re no longer just competing for workers and attention. In the new Golden Age of television, they’re now also contending with Netflix, HBO, and the shows stockpiled on their customers’ DVRs. That has led even upscale establishments to do what in the past might have been unthinkable: pack their fancy feasts (imagine foie gras a la plancha) in a plastic takeout container, and deliver it to a customer who is probably on a sofa, wearing sweat pants. It’s the reason you can now get Trade’s braised lamb shoulder delivered to your door, with a baked Alaska for dessert. Or why you can enjoy the smoked hamachi tartar from Uni or the grilled octopus in ’nduja aioli from Bar Mezzana while in your pajamas. “In our logic, the person who is sitting on their couch is not coming into the restaurant, so those are dollars that we would not have seen,” said Jefferson Macklin, co-owner of Bar Mezzana in the South End, who sent out orders of pasta tagliolini with crab, and a pair of crostini topped with smoked whitefish, on a recent Tuesday evening. But there’s one obvious challenge to introducing delivery to an otherwise upscale dining experience: managing expectations. Will customers camped out on their couch be as happy with their food as they would be in the restaurant? 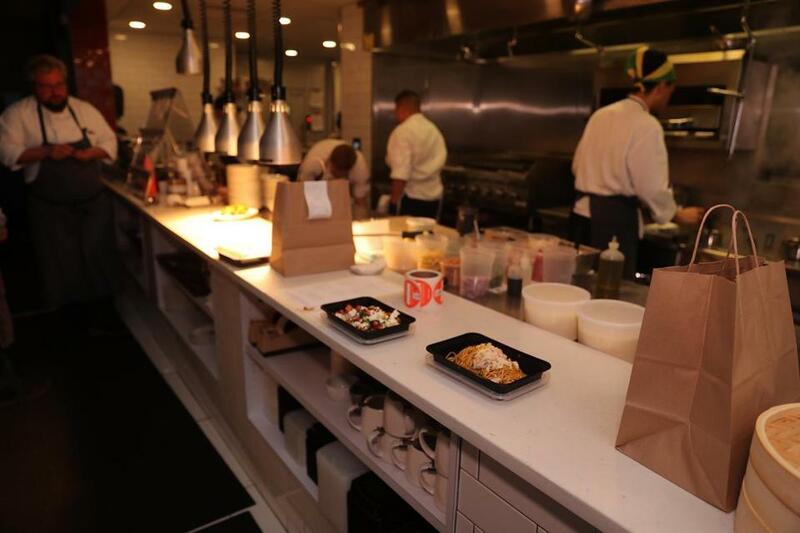 A take-out meal awaits delivery service on the counter at Bar Mezzana. Evan Deluty, who owns Stella in the South End, begins cooking orders just minutes before delivery drivers arrive, then punches holes in the tops of to-go containers so the food won’t get soggy. And he has invested in sturdy to-go bags so their contents won’t wiggle. Restaurants can also control the items that delivery services offer. Uni purposely removes dishes from its delivery menu that include fish with a short shelf life, said chef Tony Messina, who uses UberEats and Caviar to deliver actual caviar to his customers. Caviar and another delivery service, Postmates, limit their delivery areas to mostly affluent ZIP codes, including downtown Boston; other companies, including DoorDash, Grubhub, and UberEats, deliver all over Greater Boston. Some creative restaurateurs with menus that don’t travel well have actually created new menus just to cater to the on-demand eater. Will Gilson, the chef/owner of Puritan & Company in Cambridge, plans to launch a new delivery-only “ghost restaurant,” Puritan Trading Company, in early February. It will allow him to use the same kitchen and ingredients but tweak them for more couch-friendly fare, such as scallop and linguica dumplings and grilled pork belly banh mi. “We can create a restaurant that has no tables or chairs,” he said. For mid-market restaurateurs like George Athanasopoulos, who owns The Breakfast Club in Allston, the appeal of delivery is obvious: He has seen a 26 percent uptick in sales since he signed on with UberEats’ delivery service in September, and hired an employee just to handle the traffic. “She’s just bagging up Uber orders seven days a week,” he said. But he and other restaurateurs chafe at seeing outside services earn huge profits for delivering food that they have prepared. One customer, Athanasopoulos said, has a coffee and muffin delivered daily. If he walked in and purchased the order, it would cost $5. But with Uber surcharges, the bill can tally as much as $11. And after Uber fees, Athanasopoulos only makes about $3.50 on the sale. “Uber is the one making out on the deal and getting well off,” he said. Although on-demand delivery services mitigate the cost of employing delivery drivers, restaurants are still incurring significant costs: Most services charge the restaurant about 30 percent of the price of the meal before tacking on delivery charges, inclement weather charges, and other fees. For a customer, paying a hefty upcharge can be worth it for the opportunity to binge on “The Crown” while dining on Little Donkey’s caviar sandwich and Waygu steak tartar. But for restaurants, many of whom operate on already razor-thin margins, that 30 percent fee can mean barely breaking even on the sale of a meal. Many chefs rationalize that they’ve already paid staff and bought ingredients, so delivery orders allow for a return on those expenses. Others write off delivery as a marketing expense. Signing up with multiple delivery apps can be a way of being in a customer’s pocket when they’re most hungry and vulnerable. That has led some chefs to expand delivery service with gritted teeth. 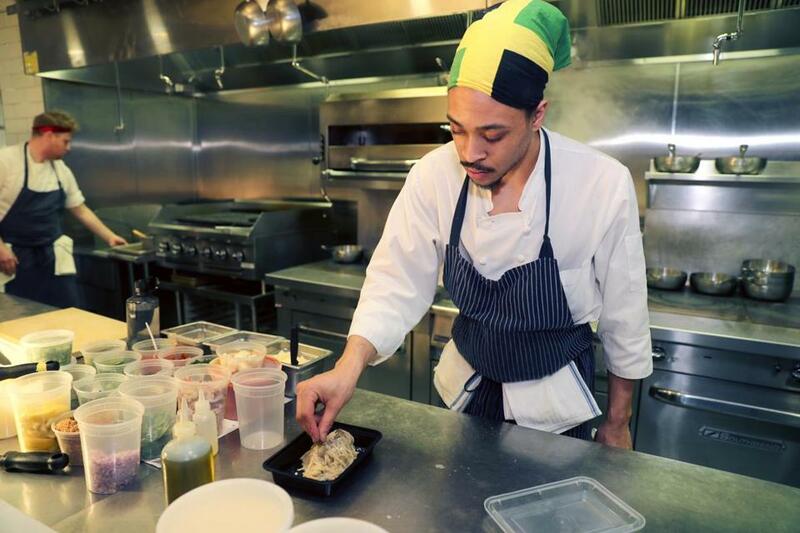 “In Boston I will probably open ourselves up to UberEats and I will probably hate it,” said Jeff Pond, the chef and co-owner of Area Four, the wood-fired pizza spot in Kendall Square and the South End. Like Macklin, Pond has been using Caviar exclusively for delivery orders, but said because his South End location is still developing, being on UberEats may help them find new customers. “You play the game,” he said with a sigh. Despite the spike in popularity of restaurant delivery, some restaurant owners are doubling down on their dining rooms, focusing on service and experiences that you can’t replicate at home. So now, he’s opting out entirely. “For me personally, it’s not a good fit for the type of cuisines I cook and the price we demand,” he said. But for restaurateurs like Eric Papachristos, who runs Trade, Porto, and Saloniki Greek with chef Jody Adams, the opportunity to bring in new revenue shouldn’t be ignored.